Roswell – Endocrinologist Dr. Mose July, MD MBBS CCD, Board-Certified Endocrinologist, Internist and Certified Clinical Densitometrist (CCD) joined Kymera in August of 2016. 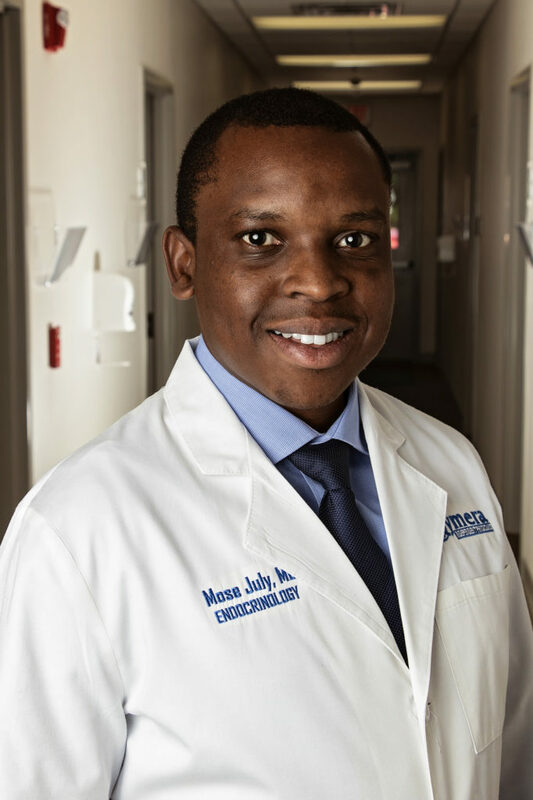 Dr. July attended the University of Botswana where he earned his Pre-Med/ Bachelor of Science degree in 2005, then went on to complete his Medical Degree at the University of West Indies in 2010. Following school, he completed his Internal Medicine residency at New York Medical College – Metropolitan Hospital in New York and later completed his fellowship in Endocrinology, Diabetes, and Metabolism at Marshall University in West Virginia. His areas of interest include Lipid Disorders, Diabetes Mellitus, Thyroid diseases and Bone Health (Osteoporosis). He was the recipient of 2 awards during residency and Fellowship – Excellence in Interpersonal Skills and Communication, and Fellow of the Month Feb 2016. Dr. July’s main objective is to provide high-quality care for patients with Endocrine problems. In his spare time, Dr. July enjoys biking, traveling, playing soccer, table tennis and chess.